I am passing this on again - I am devastated by the misery of these birds and of course the misery humans get into. This was one of the worst days in the Foundation's history. TGF was asked to help rescue over 40 macaws and cockatoos from a condemned house in Pueblo, Colorado. There was no heat and no running water. The home was owned by an 83-year old man diagnosed with dementia. There were also dogs, cats, and over 150 pigeons. The man was killing the pigeons to feed himself and feed his dogs. But the dogs needed more so killed the goats on the property. Their bodies were still littering the premises. Four birds have already died and it's touch-and-go for the rest of them. The man was feeding them dog food and the birds were housed in tiny cages with protruding nails. No toys. Mouse feces everywhere. A dead greenwing macaw lying on the floor. The birds were transported to The Gabriel Foundation's Elizabeth Colorado aviary on January 22nd. All were examined by the staff veterinarian and all received their first decent meal (in years?) and frseh water. But it may be too late for some of them. Initial diagnosis is severe malnutrition with many possibly carrying the pap virus. For more information, please go to The Foundation's Facebook page or www.thegabrielfoundation.org.There's also been numerous heated discussions about the Lisa and Alan McManus hoarding situation (Aurora, Colorado). Charges will probably not be filed against this old man. God Bless the TGF though !!! It's unspeakable, unimaginable and heatbreaking. This is a very sad story. I'm thankful that the Gabriel Foundation has stepped in to care for the 40 exotic birds/parrots. They are providing frequent updates on their website about the parrots if anyone is interested :http://www.thegabrielfoundation.org/ . I was worried about the 100+ pigeons and contacted someone who works for the GF. The pigeons (as well as a couple of dogs) are still at the man's house, and the Pueblo Humane Society is going over to feed and water all the animals. Do we know any pigeon angels in Colorado who could possibly help out? 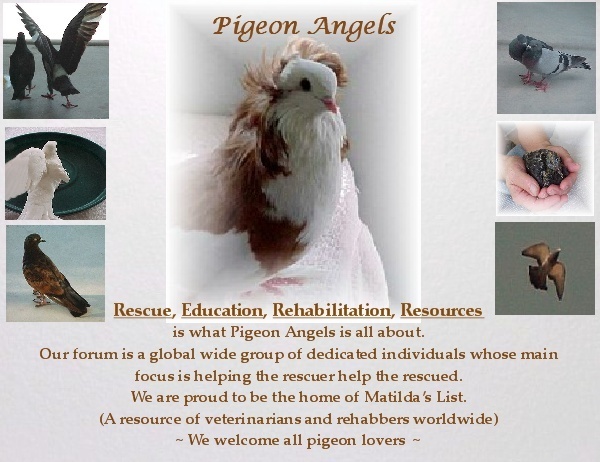 I'm thinking of contacting them to see if the need donations for pigeon feed, and maybe we can let them know about our Angels network in case they need help finding homes for the pigeons (unless they are going to let the man keep them). What do you guys think? If anyone else wants to email them or phone them, too, you can find the contact info on their website. Wish we lived closer to take in a few of the pigeons. Please keep us up dated when you find out more. I wanted to post an update on the pigeon situation in Pueblo. I sent an email yesterday and got a response today. They would need to mark the donations as “Pueblo Bird Rescue” so that the funds would be allocated to help care for these birds. The manager is also going to keep my info on hand in case the other resources fall through. I'm so glad to hear that some pigeon fanciers have stepped up to help out. A lot of coverage has been about the parrots, but it's good to know that the pigeons are being looked after, too! We appreciate the update Joyful Pigeon. Many thanks for contacting this group. Unless I'm missing something in the reply, there shouldn't need to be any 'encouragement' generated for this man and his family to reduce the number of animals he has. I agree Cindy. :Yes: The authorities SHOULD be reducing the amount of animals this person has! It was already stated that he HAD a problem keeping the number of animals he had, so leave him with maybe 5 pigeons. This would still give him enough to care for and not be a burden. Its very good to hear that other pigeon people are willing to help. Yes, I agree as well. Especially since it sounds like this man can't really take care of himself, let alone the animals.